Suffolk Naturalist: Beautiful butterflies, bees and beetles. Beautiful butterflies, bees and beetles. Hello dear readers, hope all is good with you. It's been a lovely week weather wise with many butterflies and bees on the wing. Saw my first Brimstone Butterfly fly over the garden this week along with a Comma and a Small tortoiseshell having a drink from my pond's waterfall. There was even a report of a rare migrant Large Tortoiseshell by Will Brame on Twitter, spotted not once, but a couple of times in Felixstowe. Something else that I've seen lots of this week whilst walking around my local patch Purdis Heath are these lovely 7-spot ladybirds (Cocinella 7-punctata). They seem to be all over the gorse at the moment, so when I spot one, I usually stand back and see how many more I can see and on most occasions, it's more than 10. I then take a photo on my phone and upload it to iRecord via the iRecord Ladybirds app. If you haven't got it, I suggest you go and download it now as it's FREE. It helps you to identify what ladybird you've found and even locates you via GPS. It's so simple to use and it helps the UK ladybird survey so much. Pine Ladybird (Exochomus 4-pustulatus) hiding amongst gorse flower buds. I only found it by chance when I was trying to ID a bumblebee (which turned out to be a Buff-tail Bombus terrestris) queen). Whilst out and about on my walk around the heath this week, the bees were in abundance too and at one point I was buzzed not by one but three bees in less than 30 seconds. the last one really wanted to check me out though and spent some time buzzing in front of my face as if to say, do I know you? Now you may laugh, but recent studies have found that bees are able to recognise human faces! 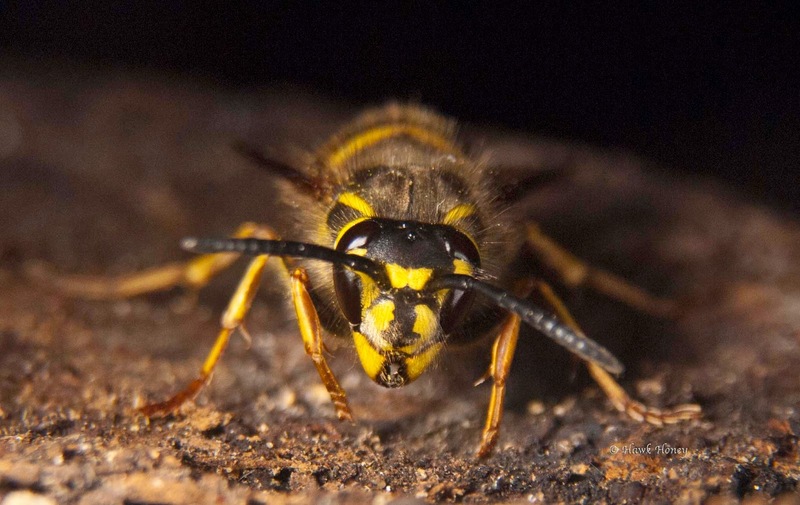 So be careful next time you try to swat that wasp (they belong to the same families as bees, Hymenoptera), they may recognise you and sting you whilst you're not looking. whilst there were many bees buzzing around me, I found one bee that had become a fatality lying on the path in front of me. It didn't seem to have any obvious injuries, so I imagine it may have been parasitised. There were also some honey-bees on the wing feeding on the gorse flowers. 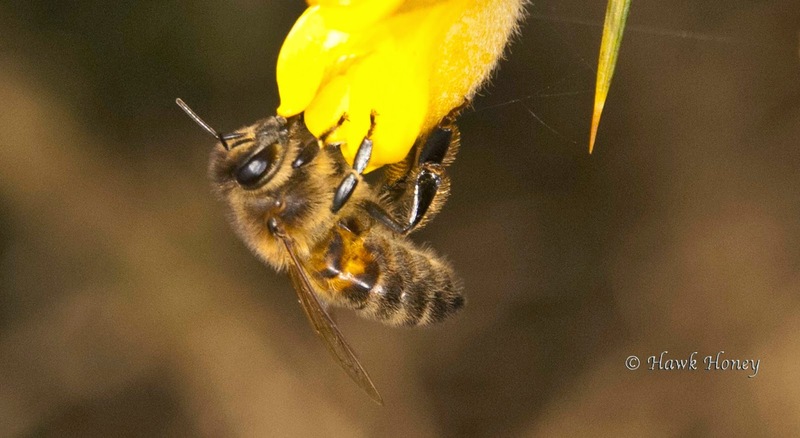 Honey-bee (Apis mellifera) on gorse flower. Cast your minds back to last year and you will recall that I reared some Emperor moth (Saturnia pavonia) caterpillars from eggs all the way to cocoons. They have spent all winter wrapped in a lattice type rubber door mat hanging on the side of my wifey's studio. The Emperor moth flight season begins in April and this is the point when all those little munching machines reach maturity. This is the one thing they have been munching their way to, adulthood. A time to procreate and carry the species on to the next generation of leaf munchers. This is emergence is something I don't want to miss as I have never seen it before in real life. So as the outdoor temperatures are pretty close to my indoor temperature, I've set up the flexarium and have placed all those cocoons within it to wait and see what happens. Pleased to meet you, I think. And your good side please. Lets just hope she didn't munch her way into any of the cocoons for a mid-winter snack. There were also four other co-habitants in the mat and these came in the form of House spiders (Tegenaria domestica). Don't worry, I will not post their pictures here. Don't tell the Daily Mail. One other spider I found this week was also another first for me and I found it whilst clearing out an outdoor storeroom. I moved a box of a shelf and there crawling rather slowly away from me was this spider. Being the good naturalist, I reached into my pocket, grabbed a specimen pot and potted it for later identification. It turns out that the spider was in fact quite a well known (for all the wrong reasons) spider called Steatoda bipunctata. Or otherwise called the False Widow spider. It also has another less known common name of Rabbit Hutch spider, but this doesn't sound very frightening or scandalous as False Widow which the Daily Mail like to bang on about. Lets get one thing straight, or several things for that matter. Yes, it can bite and is venomous, but so can all spiders, but it doesn't make them dangerous. Spiders are scared of you, humans can (and often do) harm them, so they won't come running after you to bite you. If you get bitten by a False Widow, it's pretty much the same as a bee sting, however, bees have killed more people than this spider has. In fact, this spider hasn't killed anyone unlike its cousin, the Black widow which lives on the other side of the world and I once even found one in my hair and I'm still here. They have been recorded in this country for 140 years and in all that time, they haven't killed anyone, so they're not that dangerous are they. This spider, like most things in life, will only bite you if you provoke it. So if you find one, don't go running around screaming for your life or try to shoo it away. Leave it and it will walk off and hide of its own accord. Spiders are your friend, you don't have to cuddle them or stroke them, even they wouldn't want that. But you don't have to splat them either, they provide a valuable part of our delicate ecosystems which we have pretty much messed up already, so lets not mess it up anymore. Till next time my dear readers, keep safe, keep smiling. Hi I'm your latest follower.. It's great to see the bees and butterflies about again. I love your blog - the butterfly photo is lovely. I love it when they start to emerge and it feels like spring is finally here. Good points about the false widow too - a lot of hype about them which has given them an unfair reputation really. Lovely photos here!